Risk tolerance, capacity, and need all factor into determining whether a portfolio is appropriate for an investor. Capacity and need are generally straightforward to quantify and map to an appropriate portfolio, but risk tolerance is more difficult, with many questionnaires potentially oversimplifying the process of mapping an investor into a portfolio. Companies like Riskalyze have striven to make the risk tolerance portion of the investor to portfolio mapping problem quantitative and rules-based. When used in the correct context, assessments like this can be powerful tools for getting investors into portfolios that meet their objectives. Three key inputs in the financial planning process are risk tolerance, risk capacity, and risk need. Risk capacity is the ability to take risk based on their financial situation, and it varies as an investor’s financial situation changes. Generally, more wealth, higher income, and lower liquidity needs indicate a higher risk capacity. Risk need is the amount of risk necessary to achieve financial goals. If two investors in similar situations both need to reach one million dollars in savings and are starting with account balances of $500,000 and $900,000, the risk need for the first investor will be higher. Risk need and risk capacity are generally easier to assess than risk tolerance. Capacity and need can be boiled down to quantitative results, which can be translated into specific scores or ranks for each metric. Under a set of appropriate assumptions (e.g. investment returns, volatilities, correlations, drawdowns, etc. ), these numbers can be used to match an investor with a portfolio, which is most often the goal of the whole risk assessment exercise. With risk tolerance, the process of scoring an investor and mapping them directly into a portfolio is less straightforward. Not only is there a more difficult translation between an investor’s qualitative answers and a quantitative result, but there is a critical issue of knowing what questions to ask in the first place. Assessing risk tolerance is typically done through set of 5-25 questions that focus on the investor’s perception of risk, reaction to realized risk, and choices made to seek out risk. Psychometrics is the field of psychological measurement. As with any psychometric test, an investor risk tolerance questionnaire must be reliable and valid. Validity means that the test measures what it is intended to measure; reliability means that the test is consistent regardless of whom it is applied to or when it is applied. The FinaMetrica questionnaire is one of the most popular risk tolerance assessments. While it is long by some standards (25 questions), the authors claim that the accuracy of a risk questionnaire is related to the square of the number of questions. Under the simplest assumption of proportionality, this indicates that a 25-question assessment is over 6 times more accurate than a 10-question assessment and nearly 3 times more accurate than a 15-question assessment. At least 20 questions is claimed to be the minimum for statistical accuracy. Questionnaires provided by other investment firms (e.g. Schwab and Vanguard) tend to be shorter (5-10 questions). Since many of these questionnaires are associated with robo-advisors with the goal of arriving at an asset allocation without much human intervention, there is a balance between accuracy and speed. Even though there is a smaller question set, these also include questions on investment timeframe, cash flow characteristics, and investment goals, lumping in an assessment of risk need and risk capacity, making the risk tolerance portion even more limited. Roszkowski, Davey2, and Grable argue that the short length and all-encompassing nature of these questionnaires greatly reduces their validity and reliability.3 They also claim that these risk questionnaires are simply asset allocation calculators in disguise. Barsky et. al. also assert that many questions on these questionnaires fail to capture true risk tolerance.4 They give an example from Vanguard that asks whether investors would be willing to take a gamble with $10,000 for a 50/50 chance of a specified loss or payout. Framed this way, this question may be answered differently based on the fraction of an investor’s current wealth or income that $10,000 represents, which indicates that this is more of a risk capacity question than a risk tolerance question. One solution they propose is to frame questions in terms of adjustments to an investor’s lifetime income (e.g. risking a 50% gain for a 20% reduction). While asking the question this way does not totally remove the dependency on an investor’s wealth, it standardizes across income levels, providing a higher degree of invariance. All risk tolerance questionnaires or the subsequent process of determining an appropriate investment portfolio boil down to a balancing act between the qualitative and the quantitative, and there are numerous ways to translate between the two. Many questions can be framed so that so that actual quantitative results (e.g. risk aversion coefficients) are obtainable. This risk aversion coefficient can then be used in a quantitative portfolio construction method like Mean-Variance Optimization (MVO). The MVO portfolio may only be an input into the investor’s final portfolio, but at least it is a start. When looking at risk tolerance analysis, the name Riskalyze pops up more and more frequently. They employ a purely quantitative method for questioning investors and translating those answers into portfolios, so we thought we’d take a deeper dive into (what we can gather of) their methods. Before we continue, this is my own independent assessment of Riskalyze’s process based on reading some articles explaining the methodology and taking the questionnaire myself…a few times. Since the methodology is not explicitly laid out, I may be wrong. I have verified my statements to the extent possible given the degree of transparency freely available. The Riskalyze risk tolerance assessment method is simple, and the goal is appealing: answer four quick questions, and see your “risk number”, which is a number between 1 and 99, inclusive. This risk number can then be translated into a portfolio that has an equivalent risk number. The main idea is that, with a 95% confidence, the performance of the portfolio matches the expectations of the investor, based on their risk tolerance. Riskalyze starts off with the question, “How much risk can you handle in 6 months?” Your answer is a risk neutral response of +X% and -X% where X ranges from 5% to 20%. This initial answer sets your trajectory for the subsequent questions and determines the maximum and minimum score that you can ultimately receive. The questions then look more in line with expected utility theory or prospect theory, where your larger gains are paired with smaller losses rather than the risk neutral style of initial question. The questions are framed in a way such that you can lower the risk (downside) for the same upside or increase the upside for the same level of risk. After three of these questions, you get your score and your six-month comfort zone. Voila! We can see how the upside and downside change over the range of possible risk numbers. From there, the upside/downside ratio drops precipitously down to about 5:1 at a risk number of 5 and then to 3:1 at a risk number of 10. For a risk number of 30, the ratio is about 1.75:1, which makes sense given the rule-of-thumb that investors feel losses twice as much as equivalent gains. The ratio then decreases nearly linearly to about 1.5:1 at the high-end of the risk number spectrum. X% VaR represents the loss that will be exceeded over the given period of time in X% of cases. For example, a risk number of 50 gives you a six-month comfort zone of (-10%, 15%). Assuming normally distributed returns, we would expect our 6-month loss to exceed the 10% threshold in 5% of cases. Likewise, we would expect the returns to exceed the positive 15% threshold in 5% of the cases (somewhat of an anti-VaR). Switching to the more appropriate assumption that log-returns are normally distributed, we can back out what the implied expected return and volatility of the portfolio would be that aligned with these VaR values. The (-10%,15%) threshold of linear returns translates into (-10.5%,14.0%) for log-returns. The midpoint of these is the expected return, which is 1.7% per 6 months, or 3.5% annualized. The volatility is calculated using the fact that the z-score for 95% of the area under a normal distribution curve (one-tailed) is 1.64. This yields an annualized volatility of approximately 11%. Based on the asset allocation (i.e. neglecting any benefits of security selection such as factor-based equity, tactical strategies, more specialized alternatives, etc.) of our current QuBe model portfolios (the non-taxable version), the capital market assumptions from JP Morgan, BNY Mellon, and BlackRock indicate the following 6 month ranges of returns) using the same normality assumptions. Figure 5: Hypothetical 6 Month Comfort Zones for QuBe Models Source: J.P. Morgan, BlackRock, and BNY Mellon. Calculations by Newfound Research. Based on these results, the risk number of 60 would translate the 60/40 QuBe model portfolio. Risk scores outside the range of 30 to 82 could be achieved by adding cash to the conservative portfolio or equities to the growth portfolio, respectively. That exercise seemed easy with a relatively nice one-to-one mapping of the risk result to a portfolio, but even this is not an exact science. For example, while the 6-month comfort zone for the 80/20 QuBe portfolio is close to the risk number comfort zone, it is not a perfect match. The comfort zone of the 80/20 QuBe portfolio is shifted up by 100 bps relative to the risk number assessment, which may not seem like much, but since these are 6-month numbers, the annual numbers are larger. This difference indicates a higher expected return for the QuBe portfolio for a similar volatility. This highlights a key point: there can be more than one portfolio that ends up in a similar comfort zone. And we know that investor risk tolerance can be dependent on how the risk is realized. Are 45% and 50% losses really that much different from a behavioral perspective? Someone who says beforehand that they can tolerate those losses might not be answering the same once the loss shows up on a statement. Is an investor likely to react the same when a 20% loss is seen over 6 months versus one month even if the previous 5 months were flat? If investors check their portfolio often, they are more likely to experience the losses at a deeper mental (and possibly physical) level. Is the portfolio up 5% when the market is up 30%? Reference points matter to clients. Do returns from historical data accurately forecast future expected returns? Valuations do matter, especially when there is an underlying pull to a mean. All of these points come into play when assessing the validity of a translation between a risk tolerance and a portfolio. The questions from the previous section all add nuance to how an investor or advisor determines the appropriate portfolio, even with a risk number in hand. Utilize risk-managed strategies as pivots – When the market starts to go south, tactical strategies such as trend following equities and managed futures can provide a buffer to limit losses through process diversification and de-risking. 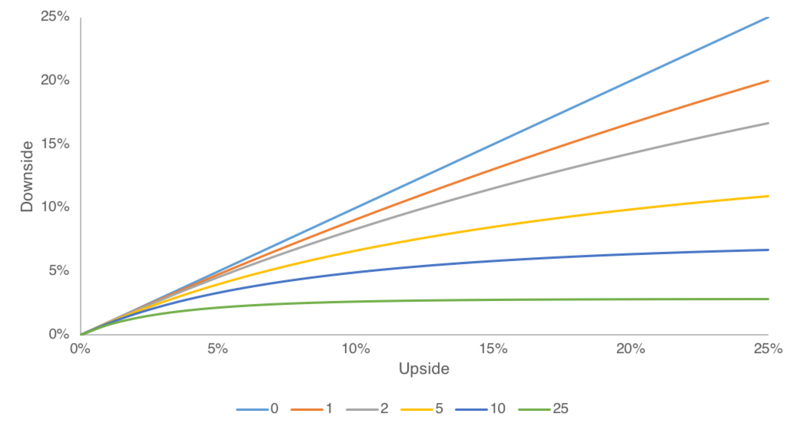 Prudently seek out diversification – Optimizing for expected returns only goes so far since the future likely will look very different from the average case. Bringing in diversified sources of return such as alternatives and multiple equity factors can smooth out the ride regardless of return expectations. Utilize forward looking assumptions – If equities increase 20% over 6 months with no earnings growth, the case for continued high returns is weakened holding everything else constant. Using a diverse set of capital market assumptions can tailor a portfolio for the current environment while reducing the risk of a poor estimate from historical data. Now that we are moving beyond the simple one-to-one mapping of investor to portfolio, there is more to think about along the way from an investor’s risk preferences to a portfolio. They also factor in correlations to U.S. Treasuries for interest rate sensitive asset classes, which should help mitigate some of the return bias seen in the 2008-2016 declining interest rate environment. Michael Kitces has a nice illustration that shows how we should conceptually integrate risk tolerance and risk capacity. The interplay between tolerance and capacity (and need) is crucial for determining an appropriate portfolio for an investor. One-dimensional thinking pushes many important considerations under the rug, but a risk number can be an important input into a more holistic process. What is the applicable timeframe for this particular investor? Is a six-month timeframe applicable? Does a risk of loss fully capture the client’s reaction to risk? Is the result appropriate given the client’s risk capacity and risk need? Evidence based questions can also be helpful for solving the issue of hypotheticals. How did the investor actually react in 2008-2009? How has the investor responded to any specific investments that they have held in the past? What investments has the investor chosen for himself? While they may not understand the risk, a heavy small-cap biotech stock allocation could indicate risk-seeking behavior. How often has the investor executed their own trades, and what were the results? How often does the investor check their portfolio? Pairing questions like these with a reliable and valid psychometric test can be a way to have more thorough coverage of the factors that ultimately determine whether a portfolio will meet an investor’s goals. I’ll be honest: We don’t know what it is. We have outlined a simple process for translating a risk assessment into a portfolio, but this is just a model: a set of rules that tries to distill down a more complex phenomenon. As with any model, especially in investing, we have to balance the complexity with oversimplification. I am not saying that any of these methods outlined previously are bad. Compared to where the industry was 20 years ago, there are many more tools available to advisors and clients for assessing risk tolerance and aligning client goals with those of a portfolio. In collecting the information on risk tolerance, you can best understand a client by diversifying the approaches used and comparing the impressions of the client that emerge from one approach with the impressions from another approach. If all indicators point to the same conclusion, the job of assessment is easy. Quite frequently, however, you will obtain discrepant images of the client. Attention should be paid not only to the client’s answer on each type of question, but also to the potential reasons why a client may be inconsistent in his or her answers from one approach to another. You should discuss with the client why he or she answered a given question a certain way, because the client’s stated rationale can provide valuable insights into which type of measurement approach may be the best indicator of the client’s level of risk tolerance. Probe and clarify until you are satisfied that you have identified the causes for the discrepancies. That is the goal for the advisor/client side. On our side – that of asset management – we will provide solutions for investors to better tailor their portfolios to their needs, capacities, and tolerances, whether they are in the form of turnkey, total portfolio solutions like our QuBe model portfolios or strategies that target specific objectives. Davey was a cofounder of Finametrica. Roszkowski M. J., Davey, G., and Grable, J. E. Journal of Financial Planning. Insights from Psychology and Psychometrics on Measuring Risk Tolerance. But you will still have inflation risk, which can be larger than you think if you are holding cash for safety. These are linear returns. Typically, logarithmic returns are assumed to be normally distributed. The two methods are similar for small returns but the approximation is not as accurate for larger returns. For example, if we assume normality, and think we are 95% confident that returns will be greater than -20%, the actual cutoff is -22%. For a perceived cutoff of -30%, the actual value is -36%.